Join your neighbors for an awesome celebration of Minneapolis’ new organics recycling program on Saturday March 19th, 10am-1pm at the Lynnhurst Community Center. Enjoy free pizza, games, children’s activities, and demonstrations. 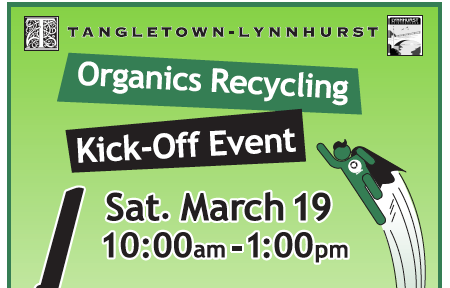 Stop by briefly or stay to catch a joint presentation at 10:30am or 11:45am from City Recycling Coordinator Kellie Kish and Director of Organics Anne Ludvik from SET, our local organics processing facility. Questions about what you can compost in your green cart? Not sure how it can work at your house? Your neighbors will be sharing tips and tricks for home set-ups in every space. Even if you’re ready to go, stop by to sign up to be a volunteer Organics Captain and enter to win one of the fantastic door prizes. The first 200 attendees can also pick up free compostable bags. Co-hosted by the Tangletown and Lynnhurst Neighborhood Associations.